A new shakeup is sweeping the streets of feminism. Not the street protests against the rash of unpunished murders of women and the even more subtle forms of violence that we all inhabit, nor against economic inequality and increasing employment insecurity. In the face of that horror, it is vital to keep rebelling. The shakeup I’m referring to is something else: the rejection of feminism by women who today occupy positions of privilege. Some brazenly assert an antifeminist ideology that dismisses the gender problem; others take a more veiled and surreptitious approach and embrace a washed-out feminism that in no way resembles the original movement. What happened? Did we believe that our own improving personal situations reflected the real experience of all women? Did we privatize our conflicts and do what it took to resolve them for ourselves alone? Did we grow weary of fighting once our own problems had been addressed? Did we forget that other women were fighting for the rights we acquired, and that we must also fight for those who have not yet obtained them? Did our well of solidarity run dry? This is the accusation made, if without all the rhetorical questions, in a cutting and merciless book-length essay that is among the most insightful I’ve read in a long time. My fellow dyed-in-the-wool feminists will raise their eyebrows when they read, immediately hereafter, that the book is called Why I Am Not a Feminist. And it wouldn’t surprise me if they did raise them—not just their eyebrows but also their objections, their protest signs, their fists—because there is a long tradition of antifeminists using that very phrase to disassociate themselves from the cause. 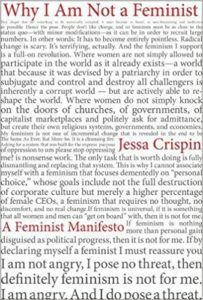 The problem, as Jessa Crispin sets it out in her powerful antifeminist (or, rather, anti-certain-trends-in-Western-feminism) manifesto, is not that women are discarding the term feminist. Strictly speaking, most of them enthusiastically embrace it. Yet that embrace is a traitorous one: their so-called feminism has nothing to do with what the movement was in its origins, an impertinent cause, a radical set of ideas. They have embraced a false feminism, one that has sought to be universally acceptable, making all kinds of concessions in an effort to recruit greater numbers, rejecting confrontation, and alienating the radical intellectuals and the bra burners. This feminism is so cowed that it’s actually impotent. It has become thoroughly banal. Mere commodification. That’s the only way being a feminist could become fashionable in the first place. It’s a cinch to be a feminist these days, Crispin says. This “cool” feminism—a feminism that is, we can extrapolate, merely lukewarm—does not require that one renounce one’s privilege or share it; it doesn’t ask that women take responsibility for their actions. Indeed, any female decision, no matter how petty, unjust, exploitative, frivolous, or conservative it may be, is sold as a feminist decision. An act of well-deserved liberation. Being a feminist in these terms implies using the historical reality of victimhood as a shield against any criticism. It means using the inequality of all women to secure the equality of just a few. It justifies any sort of empowerment, any improvement of one’s own life, even when that means trampling on the empowerment or advancement of others, men and women alike: the poor, the marginalized, those who face discrimination, immigrants. But it’s worse than that, Crispin notes with justified bitterness: lacking any sense of social obligation, devoid of political awareness, too many women applaud when others attain historically masculine positions of power (without weighing the concessions those women have made to obtain and remain in those positions) or achieve economic success (without recognizing the ways they’ve exploited other people) or become famous (without examining what they’ve done over the course of their careers to support other women on their way up). The problematic unit of measure for this stripe of feminism is how I’m doing rather than how we’re all doing. This is the most pressing point in this crisp diatribe: this pseudofeminism has conned the collective struggle, forgotten about class inequality and racial discrimination, sold itself out to capitalist values. It focused on the kind of individual success that is measured in dollar signs and devalues affection, compassion, solidarity, living together as a community. Lina Meruane is an award-winning Chilean writer and scholar, teaching at New York University. She has authored several non-fiction books and four novels. Sangre en el ojo, her most recent, received the prestigious Sor Juana Inés de la Cruz Novel Prize in Mexico and was translated into English as Seeing Red (Deep Vellum) among other languages.